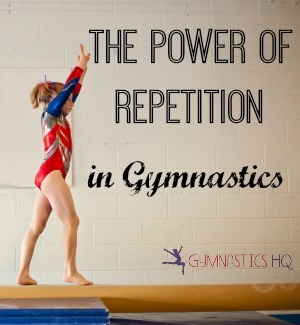 One of the most important principles in gymnastics, and one of the biggest keys to becoming a successful gymnast, is the power of repetition. And the power of repetition can be exploited regardless of whether you are a beginner gymnast, or an advanced gymnast, whether you have a lot of money to pay to spend hours in the gym, or you instead have to practice at home. The power of repetition is the principle that the more you practice something, the better you will be at it. You can utilize the power of repetition in gymnastics by practicing more hours in the gym, and by mastering the basics at home. There’s a story that my mom tells constantly that I’d like to share with you today. It’s from when I just started gymnastics. I think I was in 2nd grade, so I guess 7 years old. The gym I took classes at was doing a cartwheel-a-thon. I don’t remember specifics of the cartwheel-a-thon, but they basically challenged you to do 1,000 cartwheels. And at 7 years old I took this very seriously. My mom says I started to do the cartwheels on a Friday afternoon. And on that Friday my “cartwheels” could barely be called cartwheels. They were basically me just putting my hands on the floor and flipping my feet around the side. I would do one of these make-shift cartwheels and then run over to the sheet I was using to keep count, and I would put down a tally mark. And then repeat. My parents were just kind of humoring me as I kept doing the cartwheels over the weekend, but I was determined. However, my mom says she came in to the playroom on Saturday afternoon when I was at about cartwheel 500 and she was SHOCKED at how much they had improved. She says that while the cartwheel wasn’t perfect by any stretch, now my legs were coming over my head and it could definitely be recognized as a cartwheel. I continued to do the cartwheels and by the time I reached cartwheel number 1000 on Sunday, I was doing a “beautiful” cartwheel with my legs going right over my head with straight legs and pointed toes. I had practiced all weekend, done 1000 cartwheels, and now I had mastered the skill. This story is similar to the premise behind the famous book by Malcolm Gladwell, Outliers: The Story of Success. When I first read this book in college it really changed my outlook on life and work ethic. In the book Gladwell describes the 10,000 hour rule. To sum it up very simply, he says that to become successful in any field you must practice the task or the field for 10,000 hours. So both my story and the theory in Gladwells’s book prove that the mantra we have heard our whole lives is correct- “practice makes perfect”. I’m not writing this to try to tell you what you already know. Or writing this to make you think you shouldn’t start doing gymnastics if you are older and won’t have the years to practice 10,000 hours to become an olympic gymnast. I’m writing this to convince you that you can always improve if you’re willing to put in the time. So, when thinking about getting better at gymnastics, and improving our gymnastics skills we should always be thinking about how much we can practice. Gymnasts that spend more hours taking classes at the gym during the week are going to improve much faster than gymnasts that take less hours. The number of hours gymnasts train in the gym is something to consider when choosing a gymnastics gym for this reason. Also gymnasts that utilize their time in the gym better, by taking advantage of every opportunity to have a turn are going to improve much faster. We’ve come to the conclusion that the more hours you practice, the better the gymnast you will be. But you don’t have to spend gobs of money on private lessons and to have the maximum amount of time in the gym. You can practice at home also. Yes, you might not be able to practice your most advanced skills at home. But you can practice and master the gymnastics basics at home. You can also spend time on strength and conditioning exercises at home, which always helps to improve your gymnastics. One of the arguments for getting home gymnastics equipment is that it will increase the number of times and hours you can practice your gymnastics skills. Even for more advanced gymnasts if its just practicing basics it will still help. Because every hour you spend will be going towards your 10,000 hour threshold! Does the 10,000 hour rule mean you are to old to start gymnastics? If you start to do some calculations with the 10,000 hour rule, it can seem pretty daunting. If you average 35 hours a week (which is what Gabby Douglas and other Olympians like Kyla Ross have said they work out), for a year that is only 1,820 hours. You would have to average 35 hours a week for more than 5 years in order to hit your 10,000 hours. So does this mean you are too old to start gymnastics? No! Even if you don’t end up becoming an “expert” in the sport, you can still have a lot of fun and reap the benefits of gymnastics. Some of the benefits being the exercise you get from practicing the sport, and the camaraderie that comes with working out with a group of girls. There are plenty of programs that don’t focus on gymnasts going on to become professionals in the sport. The Xcel program (a new set of gymnastics levels) is one of these programs along with high school gymnastics teams. One of the reasons the Xcel program was developed was to retain gymnasts. The Xcel program lets gymnasts compete optional routines that are more fun and flexible than the compulsory routines of the same level. It lets coaches customize routines for each gymnasts strengths and weaknesses. So just because a gymnast can’t do one skill, doesn’t mean she won’t be able to compete that level. And since the Xcel program was introduced, it has been very popular! To wrap up, in order to improve your gymnastics, all you have to do is put in the time. Make sure you maximize your time in the gym. And at home, practice your basics and do strength and conditioning exercises. I challenge you to dedicate more hours, in order to see results! if ihave just learnt a backflip what level would i be? Well it depends on other factors as well. If you have a standing back tuck, that’s different than a round off back handspring back tuck. It also depends on your other skills. Where are your beam, bars, and vault at? Hope this helps! I was JUST reviewing this with my team yesterday!! I still can’t get my front walkover. Thanks for the article! Loved the story and how you included Gladwell. I read that book in college, and I loved how you pulled gymnastics and those concepts together. Reading the article gave me lots of new ideas. Thank you! Thank you so much!!! I just want to say how important all this is to me, Sometimes I hate how much I love the sport since I’m 12 and can’t even do a walkover. Everytime a friend comes over to my room the first thing she will think is that I’m a competitive gymnast because of all the pictures of Olympian gymnasts in my room and I feel terrible everytime I have to tell someone that I’m not, many people have laughed at me when I told them I want to tryout for competitive and it made me feel sick thinking about it. I always wanted to be a great gymnast one day but I still regret the fact that I didn’t start early and hearing someone say that age doesn’t matter gives me hope. I’ve decided I’ll tryout, I don’t care if I don’t make it because I will keep trying. You’ve inspired to keep trying and never lose hope so thank you.